The Venetian Macao Resort Hotel is situated on the Cotai Strip. The guest accommodation exemplifies the philosophy of giving guests the best of everything. The Venetian Macao Resort Hotel's 3,000 suites take elegance to a new level - at more than 70 square meters (750 square feet) each, complete with lavish Italian marble bathrooms. As Greg and I had been to Macau a couple of years ago, we took the opportunity for some well deserved R&R in this remarkable complex, which wasn't difficult to do. The highlight, of course, was the shopping complex on Level 3, which is Venice transported to the Cotai Strip, with canals and gondolas included! The loo in Suite 13031. 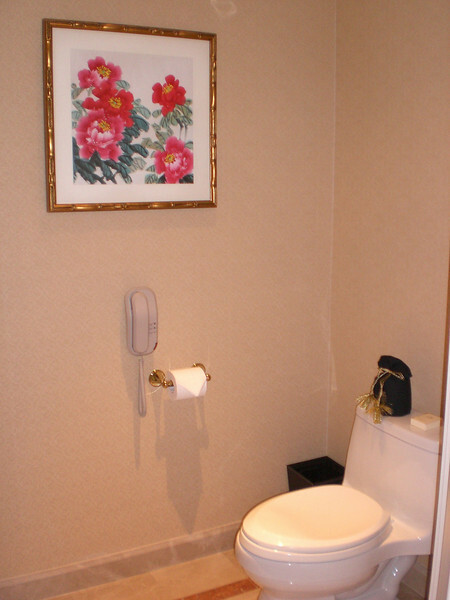 Note the wonderful black fabric toilet roll holder sitting on top of the cistern. We spent almost 2 days trying to negotiate the purchase of two of these for our home. Not possible we were told but if you buy two of our hotel bath sheets , then we can give you two of the toilet roll holders for free. So that's what we did. Go figure!